I just love it when someone prepares and serves food that is different and wonderful. It makes it even more of a treat when the recipe is not complicated and can be replicated without much effort. My daughter-in-law, Gintare, treated us to a salad that fit into this category of wonderfulness. The dish she made consisted of fresh, cubed ingredients and a simple dressing. 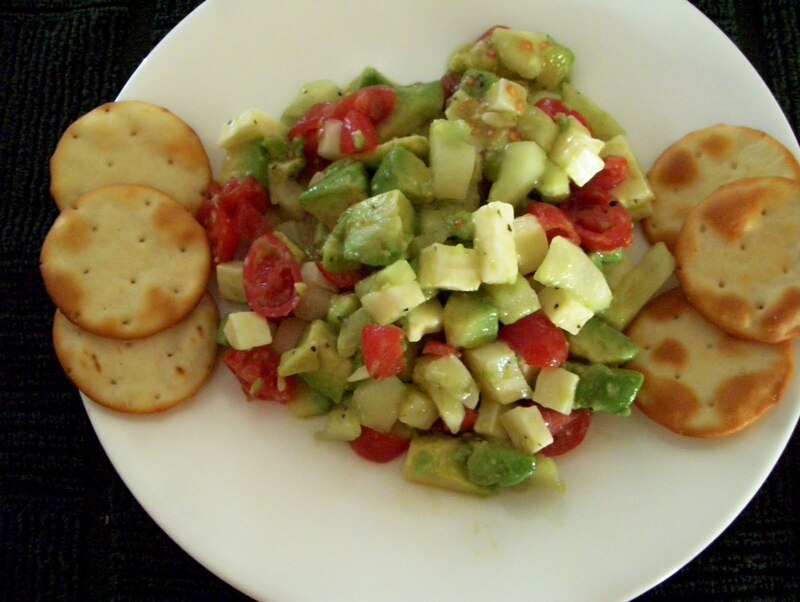 The flavor blend of this Cucumber-Avocado Salad is delicate yet satisfying and refreshing. I love the introduction of the mozzarella cheese...it is uncomplicated, slightly salty and perfect with the other ingredients. Cut all vegetables as indicated on list above and place in a mixing bowl. Add lemon juice and olive oil. Mix gently. Sprinkle with pepper blend and a dash or two of salt. Blend gently and taste. Adjust seasonings if necessary. Serve as a side dish for 4 or as an entree for two.